As much as I enjoy baking and cooking, there are still some aspects after 25 years in the kitchen that still cause me to hesitate. One of these is when a recipe requires me to boil something above 200 degrees. Boiling juice concentrates to 180 or 190 isn’t a problem, but once the temperatures go above 200, everything burns too easily. Because of this, I tend to cheat a little by bringing whatever I am cooking to between 190-200 degrees and then transferring it to the microwave to finish up. This has worked pretty good for me, as long as I remember to put it in a large enough bowl, as it tends to boil over very quickly. 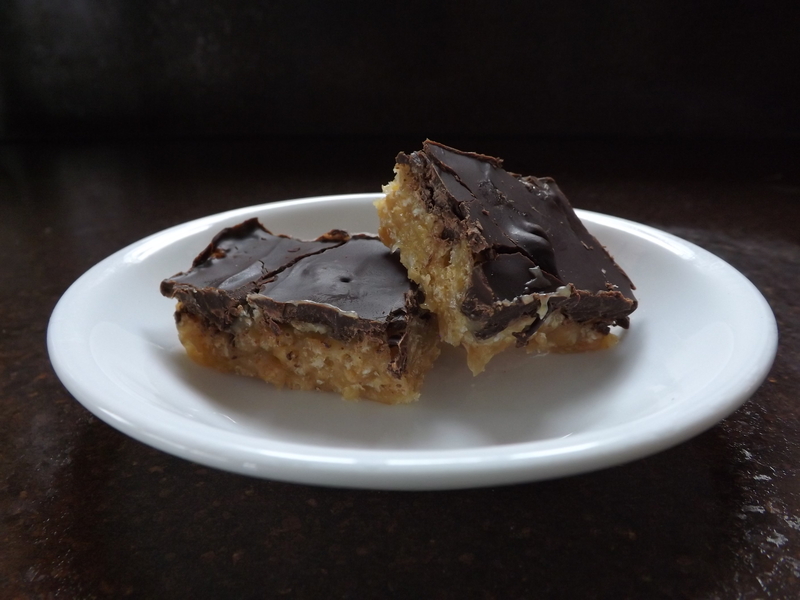 This recipe for Chocolate Crackle Toffee has been sitting in my recipe box for a long time. Because of the 240 degree factor in it, I kept putting it off. Finally, today I decided to see how my little trick or finishing the boiling process in the microwave would work on toffee. Line 9″ square pan with foil and spray with cooking spray. Melt butter in heavy-bottom saucepan. Add condensed milk, sugar and honey. Cook over medium heat, stirring constantly, until the mixture reaches 200. Remove from heat and pour into a microwave safe bowl. Microwave on high in 45 second intervals until mixture reaches 240 degrees. Stir in salt and vanilla, then the cereal. Transfer to prepared pan and sprinkle with chocolate chips. Let stand 5 minutes. Spread melted chips evenly over the toffee. Let cool at room temperature until firm, about three hours. Remove from pan and cut into 1 1/2″ pieces. Bringing the toffee to 240 degrees in the microwave worked perfectly. It did boil over a bit, but had I paid attention better, that never would have happened. I might not have confronted the real issue of tending to burn recipes that require me to bring the ingredients to a temperature above 200 degrees, but for me the solution works and that’s good enough, and for this I am — Simply Grateful.